Hey Everybody and welcome to the July 2017 A Paper Pumpkin Thing Blog Hop! If you haven't visited my blog before-thanks for stopping by. 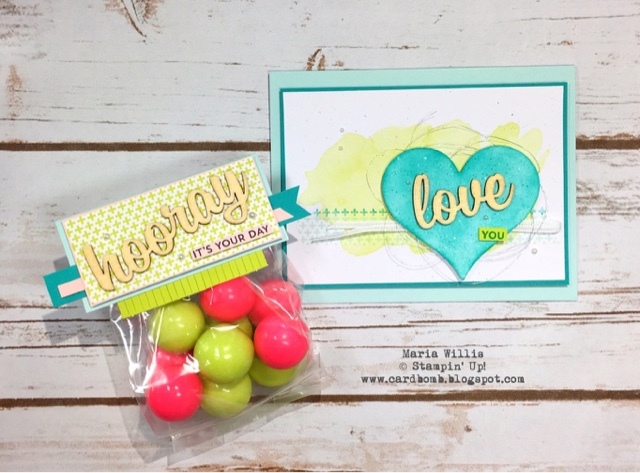 My name is Maria Willis and I am a Stampin' Up Demonstrator from a little mountain town called Boulder Creek in California, USA. I'm excited to be participating in this hop to bring you all some fun alternate ways to use your Paper Pumpkin kit. I really love that Lemon Lime Twist watercolor wash background that came in this kit. I wanted it to really pop off of the card base (also from the kit) so I added a layer of Bermuda Bay to give a good color contrast. I took one of the white hearts that popped out of the card faces and sponged it in Bermuda Bay to match the mat that I added. 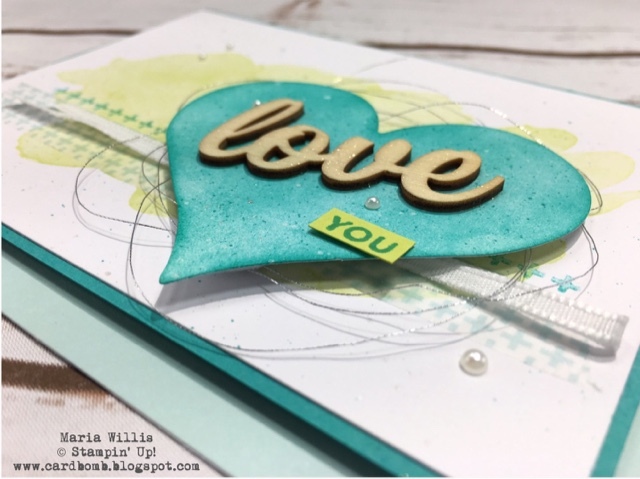 I stamped some background crosses and the sentiment in Bermuda Bay and then flicked both Bermuda Bay ink and Clear Wink of Stella all over the heart and background. I also colored the wooden sentiment with Wink of Stella to give it some sparkle. It's hard to see in the photo but it's pretty glammed up in real life. To fancy up my card I finished up by adding wash tape from the PP kit, Silver Metallic Thread, White Ribbon and some pearls. For my project I just had to use these gumballs because I thought the colors matched so well. I used a small treat bag to hold the gum and then sealed it up with a fun bag topper. All of the pieces in the topper are from this month's Paper Pumpkin kit except for the strip of Bermuda Bay and the pearls...ok, and the Black Ink. This month's kit came with Soft Sky and Tranquil Tide ink spots. This wooden sentiment is also "Stella-ed." I wish that shimmer showed up better on camera but you're just going to have to trust me that it's pretty. In case you're wondering where the paper with the Lemon Lime Twist crosses came from... check the inside of your envelopes (wink). That envelope paper is quite possibly my favorite thing in this kit and it was torture to cut it up. I hope you enjoyed both of my projects today and thanks so much for stopping by! 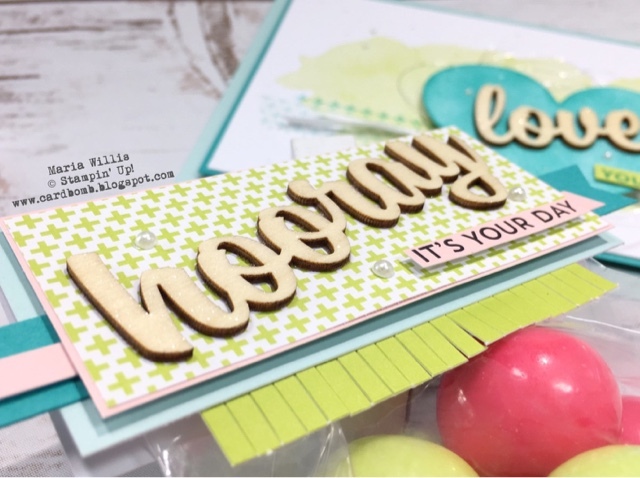 We've got so many more great ideas on this hop so please head on over to the fabulous Cindee Wilkinson's blog to see what she's got to share with you. You can just click the next button or feel free to jump around on the hop by using the blog roll below. 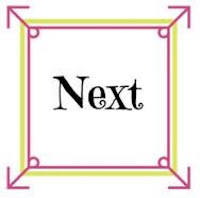 You can find links to the products I have used today below the blog roll. As always, I'm here to help, so please feel free to message me or comment with any questions that you might have. That's all for now. Cute projects! And I'm with you -- I love lined envelopes as another design element. 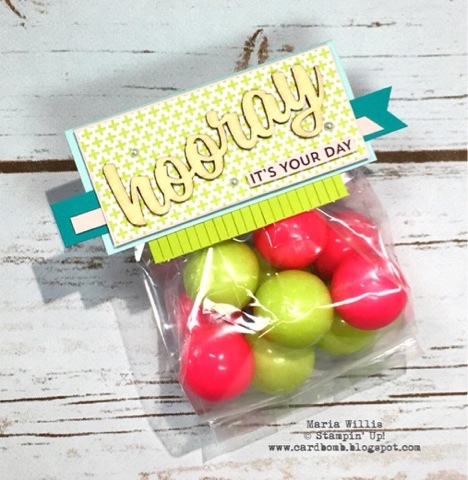 Love your projects, those gumballs really make quite the coordinating treat :-D Thanks for sharing! Thanks! The gum balls were a lucky find! Awe, thanks for noticing all of the tiny details! Your projects are so fun Maria! Love that bag topper and then card is gorg. That watercolour wash is so nice, isn't it? And you can never have too much wink of Stella! Awesome! Thanks Carhy! Agree-you can never have too much clear Wink of Stella! Great idea. I like the fringes, in addition to the HOORAY. Nice idea. Thank you Sharon! The cool thing is that both the fringe and "hooray" came in the Paper Pumpkin kit. All I had to do was put it all together. Giving It a Shot, Why Not? !